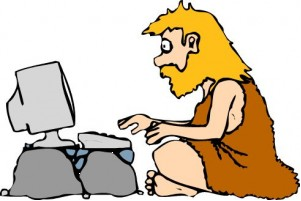 Technology is a Tool - Not a "Tool"
Just like the caveman used a club and fire, the modern man and women have tools to do the jobs of the day. The computer, and other technology, are simply that… tools of the current time. Yes, we still use clubs and fire, but just like in the caveman days, the ones what knew and used the tools the most effectively survived yet another day and thrived. It’s pretty hard to think of any position at the City where a computer type device doesn’t come in to play somehow, somewhere… or won’t be in the near future. Meter readers use handheld devices, janitors use email, offices workers spend a majority of their time on a box, Police have laptops in their cars, Fire has iPads in their hands. Water and Sewer plants run on embedded systems, and Cemetery workers use databases and soon GPS and GIS. Garage mechanics lookup manuals and help online, and soon line workers will be using iPads to see their networks of water and sewer pipes. So when we hear someone say “I don’t know much about computers” I pause and think: “How do you do your job then?” I know, maybe we’re partial to the whole technology thing since that’s our job to keep it all working, but seriously, how do you do your job the most effective and efficient way if you don’t know the tools you use? If you’re waiting for someone to show you everything you need to know then you’ll always be behind the learning curve. Just look around a little and you’ll see all kinds of help waiting there for you to be proactive with. On the COS Intranet you’ll see Computer Self Help, INCODE Help and Documents, Global Records information, how to add printers, setup email, and more. And once you are using a piece of software, nearly everything you need to know is often lurking behind that HELP button or menu item. If you say you don’t have time to learn, I challenge you that you don’t have time NOT to learn how to be more effective with the tools of the 21st century… technology and computers. Just don’t use the club or fire I talked about on the Computer.. that doesn’t help.